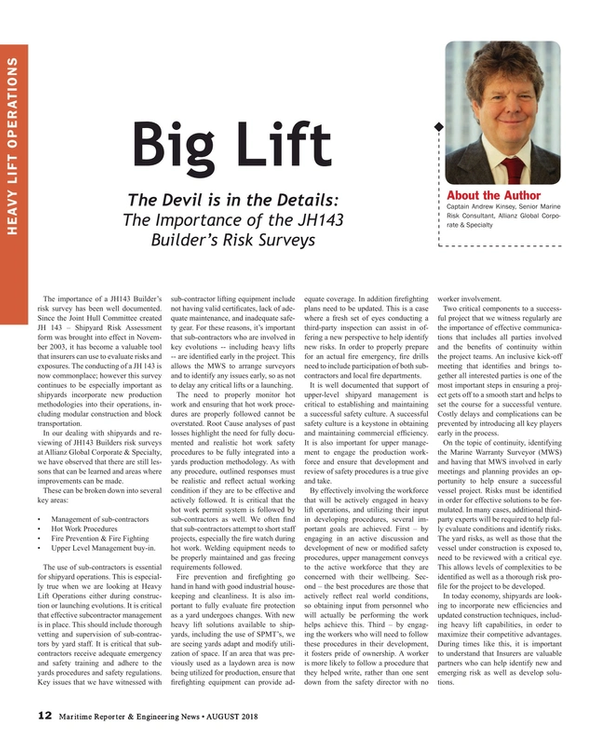 The importance of a JH143 Builder’s risk survey has been well documented. Since the Joint Hull Committee created JH 143 – Shipyard Risk Assessment form was brought into effect in November 2003, it has become a valuable tool that insurers can use to evaluate risks and exposures. The conducting of a JH 143 is now commonplace; however this survey continues to be especially important as shipyards incorporate new production methodologies into their operations, including modular construction and block transportation. In our dealing with shipyards and reviewing of JH143 Builders risk surveys at Allianz Global Corporate & Specialty, we have observed that there are still lessons that can be learned and areas where improvements can be made. The use of sub-contractors is essential for shipyard operations. This is especially true when we are looking at Heavy Lift Operations either during construction or launching evolutions. It is critical that effective subcontractor management is in place. This should include thorough vetting and supervision of sub-contractors by yard staff. It is critical that sub-contractors receive adequate emergency and safety training and adhere to the yards procedures and safety regulations. Key issues that we have witnessed with sub-contractor lifting equipment include not having valid certificates, lack of adequate maintenance, and inadequate safety gear. For these reasons, it’s important that sub-contractors who are involved in key evolutions -- including heavy lifts -- are identified early in the project. This allows the MWS to arrange surveyors and to identify any issues early, so as not to delay any critical lifts or a launching. The need to properly monitor hot work and ensuring that hot work procedures are properly followed cannot be overstated. Root Cause analyses of past losses highlight the need for fully documented and realistic hot work safety procedures to be fully integrated into a yards production methodology. As with any procedure, outlined responses must be realistic and reflect actual working condition if they are to be effective and actively followed. It is critical that the hot work permit system is followed by sub-contractors as well. We often find that sub-contractors attempt to short staff projects, especially the fire watch during hot work. Welding equipment needs to be properly maintained and gas freeing requirements followed. Fire prevention and firefighting go hand in hand with good industrial housekeeping and cleanliness. It is also important to fully evaluate fire protection as a yard undergoes changes. With new heavy lift solutions available to shipyards, including the use of SPMT’s, we are seeing yards adapt and modify utilization of space. If an area that was previously used as a laydown area is now being utilized for production, ensure that firefighting equipment can provide adequate coverage. In addition firefighting plans need to be updated. This is a case where a fresh set of eyes conducting a third-party inspection can assist in offering a new perspective to help identify new risks. In order to properly prepare for an actual fire emergency, fire drills need to include participation of both sub-contractors and local fire departments. It is well documented that support of upper-level shipyard management is critical to establishing and maintaining a successful safety culture. A successful safety culture is a keystone in obtaining and maintaining commercial efficiency. It is also important for upper management to engage the production workforce and ensure that development and review of safety procedures is a true give and take. By effectively involving the workforce that will be actively engaged in heavy lift operations, and utilizing their input in developing procedures, several important goals are achieved. First – by engaging in an active discussion and development of new or modified safety procedures, upper management conveys to the active workforce that they are concerned with their wellbeing. Second – the best procedures are those that actively reflect real world conditions, so obtaining input from personnel who will actually be performing the work helps achieve this. Third – by engaging the workers who will need to follow these procedures in their development, it fosters pride of ownership. A worker is more likely to follow a procedure that they helped write, rather than one sent down from the safety director with no worker involvement. Two critical components to a successful project that we witness regularly are the importance of effective communications that includes all parties involved and the benefits of continuity within the project teams. An inclusive kick-off meeting that identifies and brings together all interested parties is one of the most important steps in ensuring a project gets off to a smooth start and helps to set the course for a successful venture. Costly delays and complications can be prevented by introducing all key players early in the process. On the topic of continuity, identifying the Marine Warranty Surveyor (MWS) and having that MWS involved in early meetings and planning provides an opportunity to help ensure a successful vessel project. Risks must be identified in order for effective solutions to be formulated. In many cases, additional third-party experts will be required to help fully evaluate conditions and identify risks. The yard risks, as well as those that the vessel under construction is exposed to, need to be reviewed with a critical eye. This allows levels of complexities to be identified as well as a thorough risk profile for the project to be developed. In today economy, shipyards are looking to incorporate new efficiencies and updated construction techniques, including heavy lift capabilities, in order to maximize their competitive advantages. During times like this, it is important to understand that Insurers are valuable partners who can help identify new and emerging risk as well as develop solutions.